Lens with light reflected off ceiling. 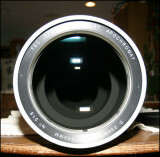 Lens with direct light at angle. Lens with direct light from straight ahead. Mike - simply one of the best scopes ever made. Makes me weak in the knees looking at your setup plus those dark skies. Dwarfs my Tec140.